Published on Nov 21, 2016 'Snow Flurries' was on the programme for the Johnsonville SCD Club's final night for 2016. 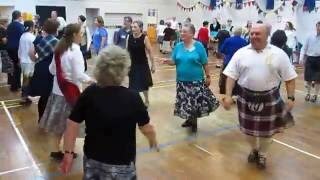 This strathspey was devised by Charlotte Williams (née Dunn) for the Lower Hutt SCD Club's 60th Anniversary. Snow is very rare in Wellington and the Hutt Valley, and the dance title refers to a time in 2011 when the district experienced just a few magical days of snowfall.